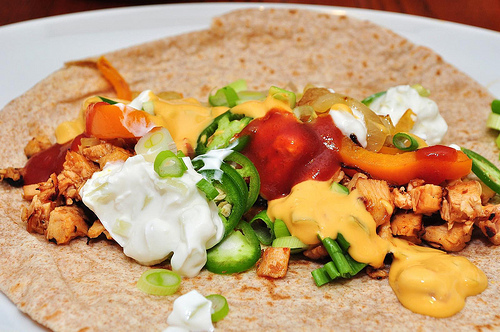 These phenomenal gluten free chicken fajitas include onions, green peppers, zucchini and more. 1. Heat oil in heavy skillet. Add chicken strips and chili powder over high heat, stir constantly for 5 min, or until cooked. Drain and set aside. 2. In the empty skillet, add onion, garlic and jalapenos to oil in pan and saute over high heat for 2 min. Add bell peppers and zucchini; cook over high heat for 4 min, or until vegetables have a blackened look around the edges. Return chicken to pan and heat until sizzling hot. 3. While the chicken is reheating wrap the corn tortillas in a damp paper towel and microwave for 30 sec. Serve right away with sour cream, cilantro, refried beans and salsa, if desired. ◊ To speed up the cooking process for this recipe purchase one of each (6oz) precooked chicken and steak strips from the store. They are not as budget friendly, but they are great way to whip up a fast, tasty meal. Try this fresh, appetizing guacamole with your Mexican dinner tonight. This scrumptious, fulfilling soup can be enjoyed all year round.